The first step to the Stingers‘ new strategy seems simple enough: Have a weak start to the game and finish the first period down by two goals. That’s what happened last week against McGill and Ottawa and it’s what happened again against the visiting Queen’s Golden Gaels. The next step? Dominate the next period, outshoot the opponent, and enjoy yet another comeback. Despite a weak start, the Stingers pulled off a third comeback victory in a row and a fourth overall in their recent win streak. “We didn’t panic. We didn’t play a good first period and we stepped up our game after that. There’s a lot of little details we need to work on but we showed a lot of character coming back from a two goal deficit,” said head coach Marc-André Élement. The Stingers still didn’t look worried after giving up two powerplay goals, losing Philippe Charbonneau defenseman to injury, forcing the rest of their blueliners into playing heavier minutes, and looking outplayed through much of the first period. In fact, they suddenly looked energized. The Stingers were winning puck battles, speeding around their opponent’s zone, and forcing the visiting goalie into making athletic saves. The home team was suddenly doubling their opponent’s shot count and were in control, even if the score wasn’t even yet. 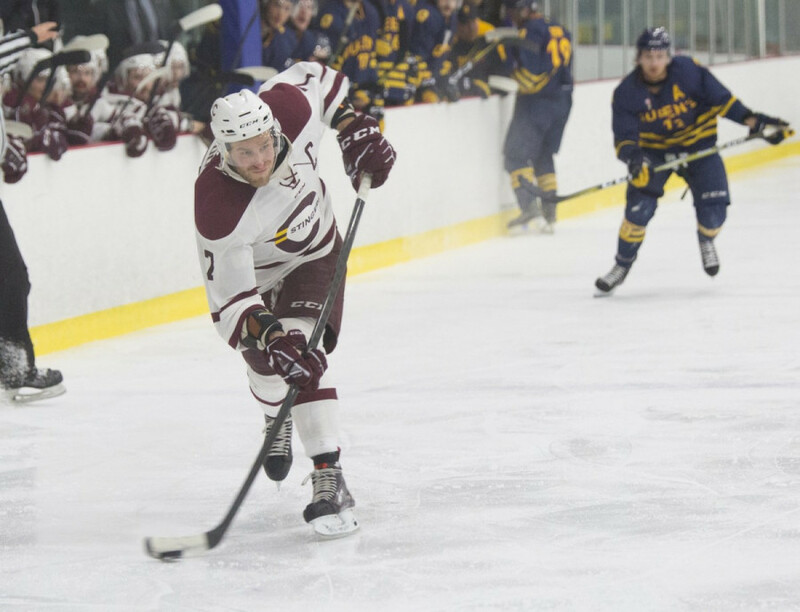 “From my point of view we absolutely dominated them in the second and we carried that into the third too,” said Stingers captain Philippe Hudon, who matched his career high point total of 20 against Queen’s. The Stingers second period saw centre Jean-Philippe Beaulieu score the Stingers’ opening goal, while Simon Bourque notched his first career U sports goal on a powerplay one timer. The Golden Gaels would retake their lead on a goal with less than 20 seconds left in the second frame. What was described as a minor injury also kept rookie goalie Anthony Dumont-Bouchard from starting the third, so veteran Marc-Antoine Turcotte came into the third period cold. The Stingers still looked undeterred, controlling the pace and play of the game’s final period early. The confidence of winning nine of their last 11 games had them riding high. Being down by a goal in the third with a goalie who had not played in several games didn’t seem to bring any stress. They were used to going down and coming back. “It seems to be something that keeps going on every game. When we put ourselves in that position we know we can get ourselves out of it,” said Carl Neill, who scored the game winner and leads the team in points with 24. A combination of the team’s newfound depth and top end talent sorted out the third period win. Queen’s couldn’t solve Turcotte, while Zachary Zorn scored the game tying goal three minutes into the period after sitting out several games as a healthy scratch before returning to centre the team’s fourth line. Neill then completed the comeback with a heavy shot from the blueline with less than five minutes to go. The recent streak has the locker room feeling more confident than ever according to the team. New players have begun to gel and feel welcome, while older ones have found plenty of reasons to enjoy the game. They know that games have been close and that they can’t get overconfident, but they are certainly enjoying the ride towards the end of the season right now.